Diplomats from Saudi Arabia have now been linked to the September 11 terror attacks, just in time for Pres. Obama’s already controversial visit to the kingdom amid growing tensions over classified documents. Newly revealed information shows a flight certificate for al-Qaeda bomb-maker Ghassan Al-Sharbi had been discovered stuffed inside a Saudi embassy envelope by officials who arrested him in 2002. Though he didn’t participate with others that day, the Saudi national had taken flight lessons with the hijackers prior to the attacks. That document had been written by investigators looking at the possible roles foreign governments played in the 9/11 attacks when they stumbled upon Al-Sharbi’s flight certificate inside an envelope from the Saudi embassy in Washington, D.C.
Al-Sharbi reportedly buried a number of documents just prior to his arrest, and the certificate is believed to have been amongst them. If Congress passes that bill, the Saudis have vowed to yank billions in U.S. assets — a move that would certainly crash the dollar, along with global markets. Caving to what amounts — on the surface — to political and economic blackmail, Obama conceded to the Saudis by vowing to veto the bill. Of course, his decision wasn’t as simple as choosing between allowing 9/11 victims’ families a mere semblance of justice or crashing global financial markets. “If we open up the possibility that individuals in the United States can routinely start suing other governments, then we are also opening up the United States to being continually sued by individuals in other countries,” Obama explained in an interview with CBS News. But, in actuality, there is far more at stake than lawsuits targeting the U.S., considering the implications of exposing possible roles the government might have played in any terror attacks around the world. Allowing families to seek justice for possible Saudi involvement in the attacks would as easily allow families of victims from other countries killed on 9/11 to attain justice for any role the U.S. government potentially played — including on American soil. Countless theories still circulate about the missing 28 pages of the report on the September 11 attacks — but perhaps nothing has evidenced how far-reaching their contents may be until events of the last week. Whether the Saudi government had direct or indirect participation in the attacks might be revealed in June when Obama has promised to make a decision about releasing the 28 pages. Joining the families of victims and growing calls in the U.S. and around the world to release the documents, presidential contender Donald Trump has previously intimated Saudi involvement could be laid bare with their disclosure. Perhaps the Saudis, realizing Obama’s current dilemma, capitalized on his visit to reiterate their economic threat. 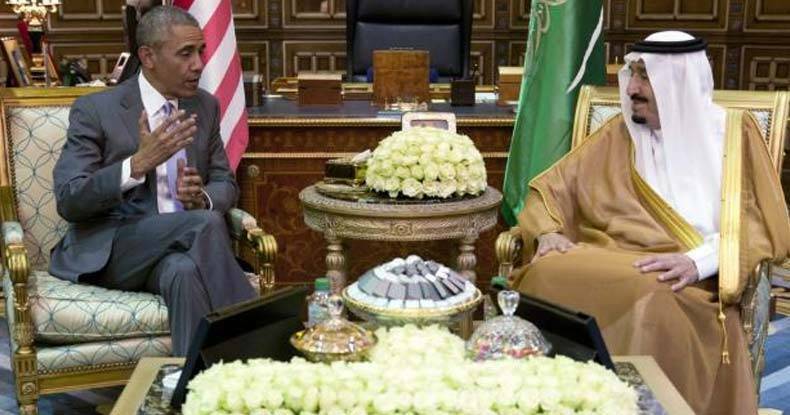 Instead of being received by King Salman when he arrived in Saudi Arabia for the Gulf Cooperation Council summit, Obama was met by Prince Faisal bin Bandar bin Abdulaziz Al Saud — the governor of Riyadh. Gulf Research Center security analyst Mustafa Alani advised such a greeting by a lower-ranking official delivers an intentional message displaying Saudis lack of faith in the U.S. president. It also appears to be a less-than-subtle reminder, as the adage goes, to keep your enemies closer.